Yesterday I started stripping Christn's interior. As expected there was quite a bit of rust. But I got sorely ticked when I realized that somewhere in her past, someone glued down a horrible mix of hard-board and tar to her floor pan. This of course, served no purpose, other than to make sure that water got trapped between the pan and the boards. 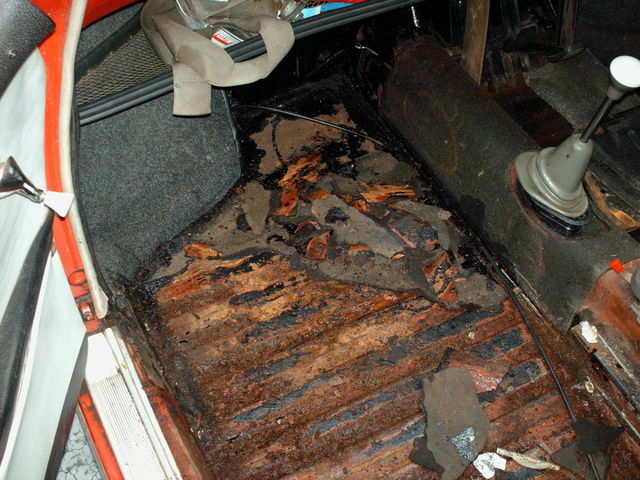 As a result, there was a tremendous amount of rust and sections of the pan have rotted through. The pictures actually make it look better than it is. If anyone out there know why this kind of thing was ever done, please let me know, as I have a very similar installation in Lady (my 68 Beetle). this is Jurgen from Germany . I also own some Type 3`s since over 22 years . 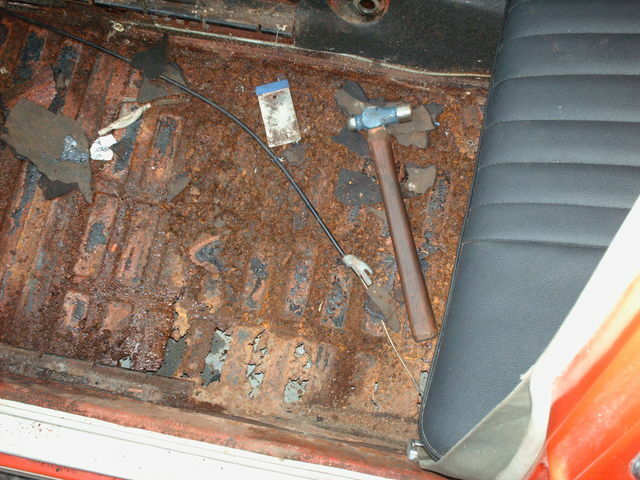 The Tar-plates under the carpet ( or rubber ) have been installed from the factory to provide resounds from the metal sheets . Every Type 3 has rust under the plates . You have some nice Type 3's there Jurgen. The type 34 is a particularly nice find. I believe there is only one of those down here her SA.